Yesterday, I was on strike. I haven’t been on strike before. It wasn’t a decision I took easily but was a considered thought as a result of weighing up the action that I judged to be necessary. I’m glad I was striking and wanted to share some of my perceptions of the day. I started out early as I had offered to join a picket line outside my place of work. It was a picket line staffed mostly by social workers with a CPN (Community Psychiatric Nurse) joining us. We had supplies of banners, leaflets and whistles to hand out to passers-by and those who were going to work. 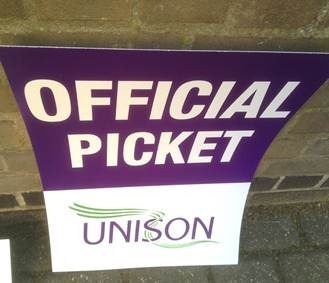 We had resolved that, knowing the decisions we had each struggled to make, we would not be giving a ‘hard time’ to those who needed to go to work – whether union members or not – and indeed, we had people nipping out to offer us tea, coffee and biscuits during the morning. As for passers-by, they were very supportive save for one person who seemed to drive his car towards us at alarming speed and thought this constituted a ‘joke’. I suspect he regards Jeremy Clarkson as a role model. We also had a number of service users pass by for chats. We had a lot of support, kind words and chuckles to share. At a certain point, most of us went on to a local rally where we met up with those striking from other unions and where we were addressed by local union leaders and politicians. The area was packed. There was a great deal of support from passing buses, cars, bicycles and vans hooting at what was, by this point, a very large group. It didn’t feel like a ‘damp squib’. It felt like a large group of people who would really rather be at work making a point on an issue that was important to them. I used public transport to get to the main London rally after this. 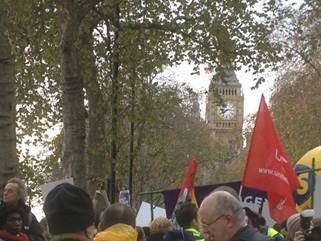 Here it was I met up again with some more people I work with and we marched together to the Victoria Embankment. We had an extensive opportunity to chat to those around us. 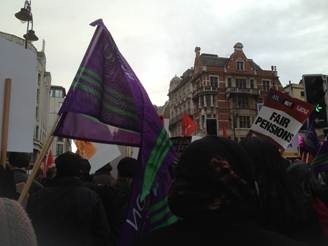 The anger and discussions were by no means focused on the pension issue although that was what our banners were saying. We spoke to those on the march and one of the most commonly quoted phrases was ‘divide and rule’. This government wants to present public sector workers as a demon class sucking the lifeblood from the economy by our ‘gold plated’ pensions and lack of concern for those ‘hard-working taxpayers’ (because it’s clear in the government’s rhetoric that a) public sector workers don’t work as hard as those in the private sector and b) are all overpaid) who are ‘suffering’ today. Divide and rule. This is what this government thrives on. By pitting public sector against private sector instead of rich versus poor, they get away with their plain nasty mean-spirited inequitable policy planning that pushes the burden towards those who have the least and makes us drop our guard towards the anger that should be directed at those at the ‘top’ – both public AND private sector who cream the benefits for themselves. Cameron and Osborne come from worlds of privately educated privilege. It feels that they don’t have an understanding of poverty, deprivation or the anxiety that lack of certainty about retirement can bring. They and the cabinet, indeed, no MP will have to worry about what their own pensions will be like. This IS a battle of ‘US v THEM’ but it is not, and it shouldn’t be ‘private v public’ – it should be ‘haves v have-nots’ which is why for this battle, we should ally with those who have been targeted by the government because they are unable to work or unable to find work and those people with disabilities who are forced to jump through hoops to prove themselves to various men in suits from private companies that are all growing richer on the back of government contracts. I walked, I shouted, I waved and I showed that I am not going to allow this government to peddle lies and will fight them at every moment that I can. Yesterday was not a ‘day off’ for me. I left the house earlier than I would have on a work day and arrived back just before I would have but I didn’t stop – not for a moment (um.. next time, I’ll remember to bring a packed lunch with me!). And today, when I go into work, I’ll pick up on the things waiting for me that I didn’t do yesterday, I expect I’ll work through my lunch (I usually do) and possibly stay late – if not today then another day this week – because I will have to catch up on the work I didn’t do probably in my own time – unpaid. For me, it was no ‘damp squib’. It was a chance to show this government that I am not a sheep and to exercise my legal right to withdraw my labour. The insult that Cameron dealt us by referring to the strike as such, proves the worth he values to that right to withdraw labour. Ironic really, when you consider that the Conservatives are a minority administration – yes, there is a so-called ‘coalition’ but I voted Lib Dem (never again) and they do not speak for me. Not at all. This entry was posted in politics, social policy and tagged #n30, david cameron, george osborne, jeremy clarkson, liberal democrats, november 30, politics, reports of strike, social policy, social work, strike, trade unions, unison. Bookmark the permalink. There’s a definite unintentional irony in Jeremy Clarkson lambasting others for having a “gilt-edged” lifestyle “while the rest of us have to work for a living”. Yeah (finally succumbed and watched the clip this morning). Worth remembering he’s a close friend of Cameron..
well done for being out there!